Historiated initial O on a single leaf from an Antiphonal, painted in Regensburg in a style that is characterized by a naïve, lively charm. The chant is the first responsory recited during Matins at Good Friday. Miniature. Tempera, gold, and silver on vellum. Leaf: 453 x 366 mm. Initial: 78 x 81 mm. 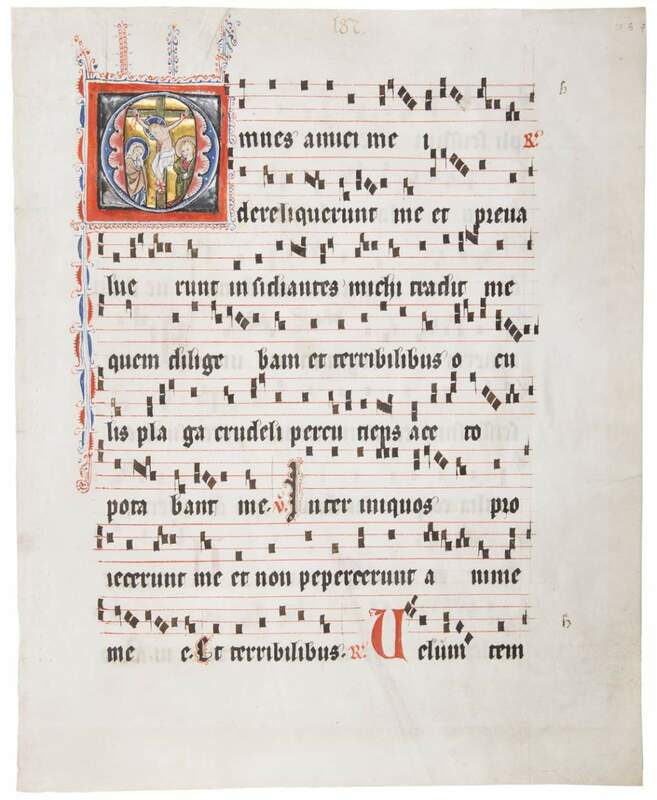 This enchanting leaf belonged to a well-known Antiphonal made for the nuns of the Dominican convent of the Holy Cross in Regensburg in the early 14th century. This was the oldest female community of that order in Germany. Generously funded by bishops and private sponsors, the convent enjoyed financial prosperity, which enabled the commission of expensive manuscripts. The blue letter O on a field of silver outlined in black ink, fills a square frame to set the stage for the Crucifixion. The illuminator was quite successful in fitting a comprehensive, emotional scene into a small space through the articulation of the figures' gestures: one feels the sadness of the Virgin clasping her hands and St. John putting a hand to his cheek. The proportions and sweet faces lend this initial an innocent air. The figures have delicately drawn faces with gently red-dabbed cheeks. The application of colour juxtaposed with strong black contouring lines is reminiscent of stained glass. Medieval Regensburg, the capital of Bavaria in the Middle Ages, was one of the most important political, religious and cultural centres in central Europe. It was a large and prosperous city that counted many monasteries in or nearby, like the great Benedictine abbeys of St. Emmeran and Prüfening. The Dominican nuns of the Holy Cross were, therefore, well positioned to commission fine books necessary for their daily liturgical offices. Such books gave visual expression to the piety of these women and are testimony to their meditative mysticism. This leaf with text and music for Holy Friday honoured the Passion of Christ – celebrated and recited each year over again in the liturgy of the Holy Week. As fear and anxiety are a natural part of suffering, Christ took these human feelings upon himself. The images of the Crucifixion were to bring consolation as in Christ's sacrifice hope for salvation was preserved. The fine initial O opens the mournful lyrics: Omnes amici mei dereliquerunt me, et praevaluerunt insidiantes mihi (All my friends have forsaken me, and my enemies have prevailed against me, which is recited at Matins on Good Friday in the Holy Week. It is one of the many responsories for the Holy Week still sung today. It's long musical tradition goes from Gregorian to music composed by, among others, Francesco Corteccia (d. 1571), Carlo Gesualdo (d. 1613) and Franz Liszt (d. 1886).